Red are Saxons, Purple Romans, Green are Irish and Blue are Welsh. I'm going to start as the Saxons in the Lincoln/Nottingham area (7) with the object of bringing all of England under my iron heel. 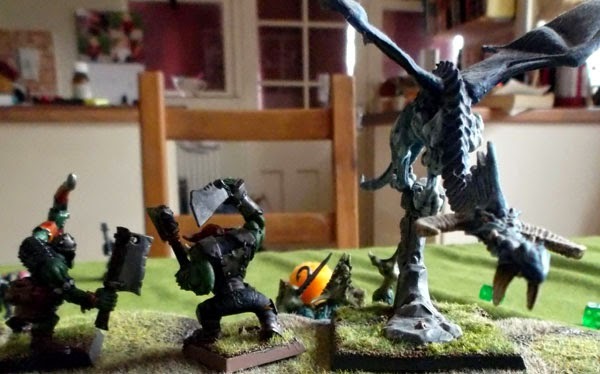 I may play some solo games, but my main plan is to generate the armies and scenarios and then rope in other folk to play my enemies. Should keep me amused for a while. And maybe make me finish off my Musketeer Late Romans. 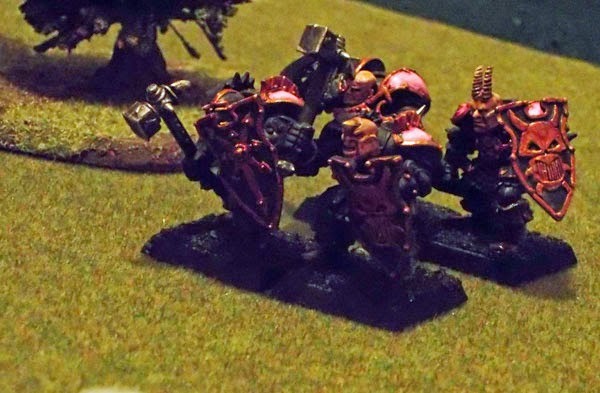 The original article for the campaign suggests simple army lists for DBA, but I'm using Dux Bellorum, so need a slightly different army generator. I'll stick with the score on the cards indicating the number of bases - 6-8 being an average size for a Dux Bellorum game. The first base will, naturally be your companions, with the majority of the rest of your force being warriors (or shieldwall for the Romans). 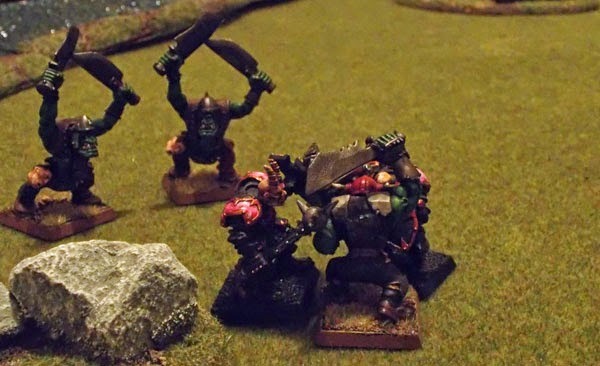 For every third base a dice roll to decide between nobles, riders or skirmishers and then a final chance of getting one of the upgrades should give some variety. 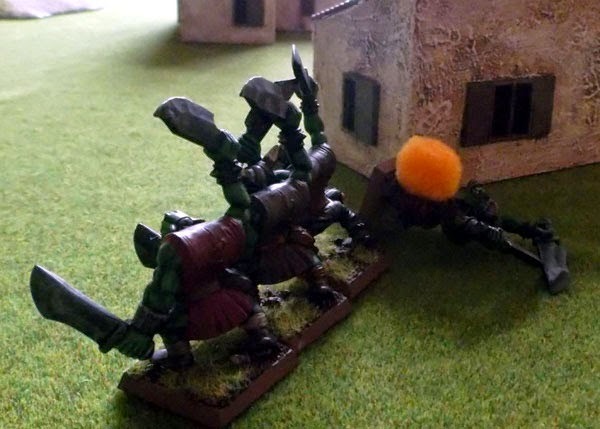 Dice for the companions, and the result will dictate whether the majority of the army is foot or mounted. 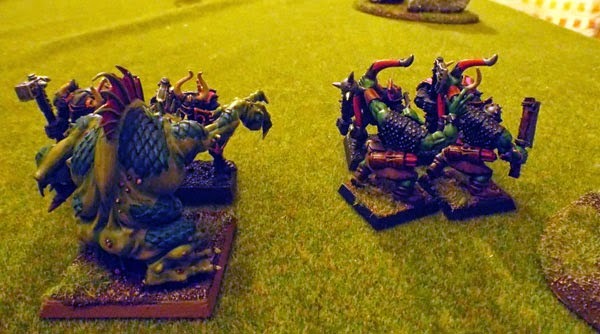 So if you have mounted companions then result two, five and nine will automatically be more mounted troops, and ignore the foot warrior and noble options for 4, 7 and 10. And the reverse if your companions are Foot. 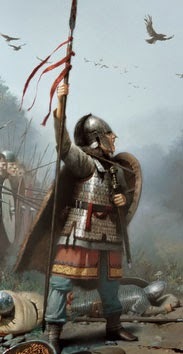 The Roman lists have quite a few options in Dux Bellorum, so I'm considering two different selectors for them. 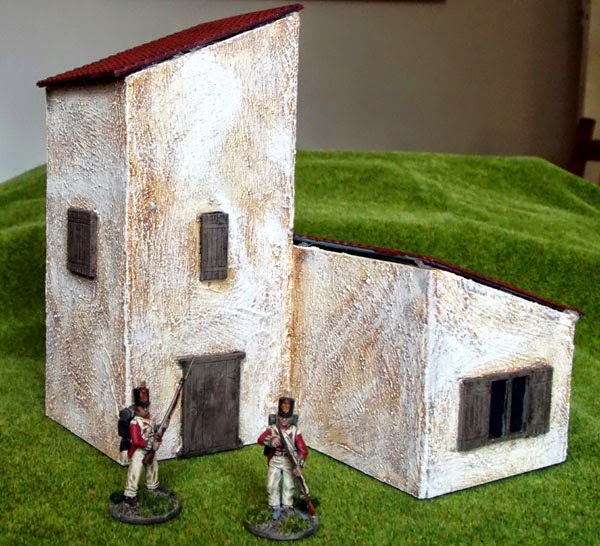 One for the towns and one for the "field armies". Need to muse for a little longer yet. I bought this from Lidl. It was less than a fiver. No idea how useful it'll be, but for that price you can't go wrong. If it just shines some bright light on my painting I'll be winning I reckon. 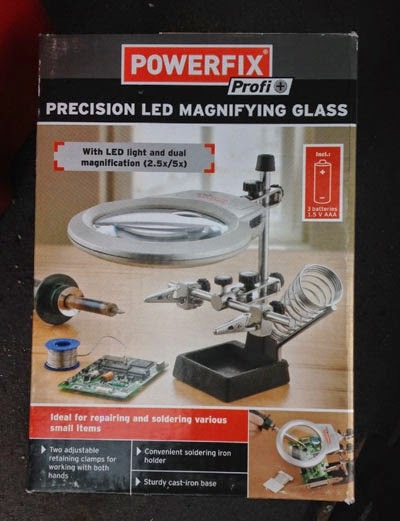 They also had some cheap Dremel like rotary tool sets for £17 (but I already have one of those). 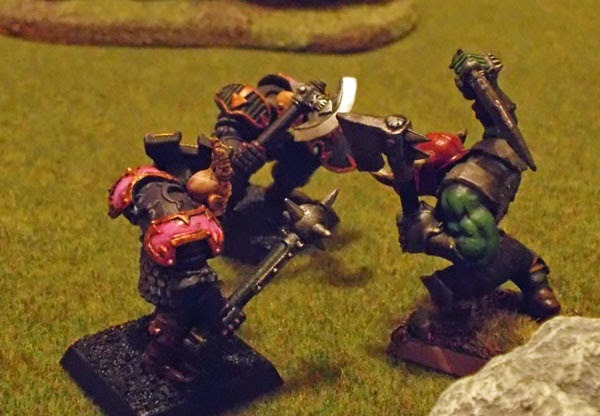 Flush with success after the last game smallest boy once more demanded my Orcs take on his Chaos Warriors. This time we would be playing the Treasure Hunt scenario, so three beads were placed to represent the potential hiding spots. Our army lists were the same as in the previous battle. I gained the advantage in the early moves, taking advantage of my leader to move groups forward. My lone left hand treasure hunter got lucky and was soon in position to hunt for the loot. 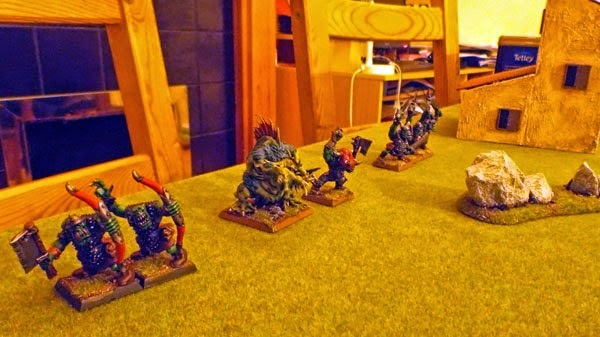 The rest of the lads advanced whilst I failed to roll enough activations to actually investigate the first treasure. Meanwhile the Chaos forces surged forward too. 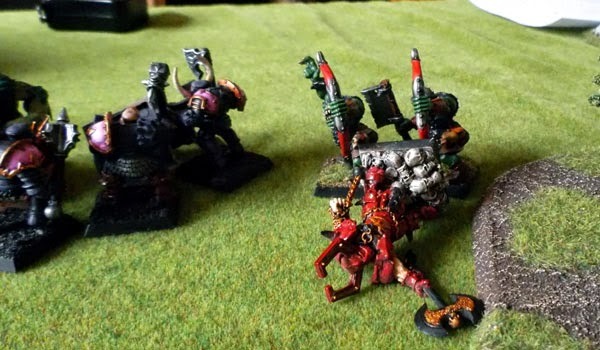 Finally the lone Orc got his act together and discovered treasure at his feet! 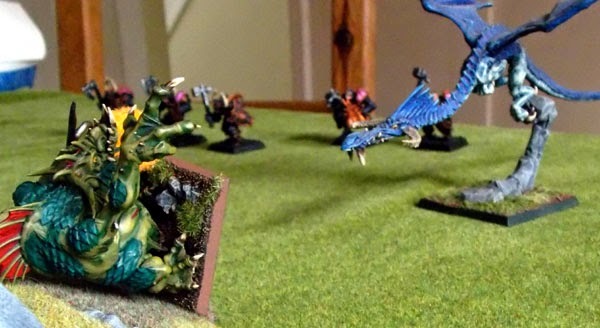 Throwing caution to the wind the Chaos general urged the dragon on to hunt down the treasure laden Orc as the battlelines came together. 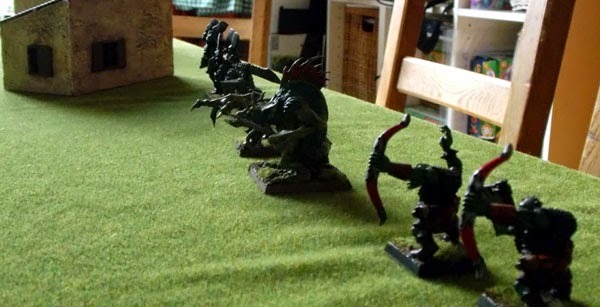 Despite being singed a couple of times the Orc treasure bearer made good his escape. Just as the camera ran out of power. 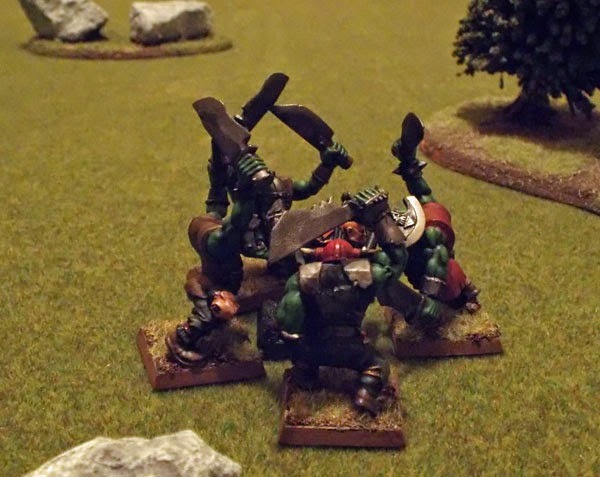 Unfortunately by this stage most of the Orcs were locked in combat. 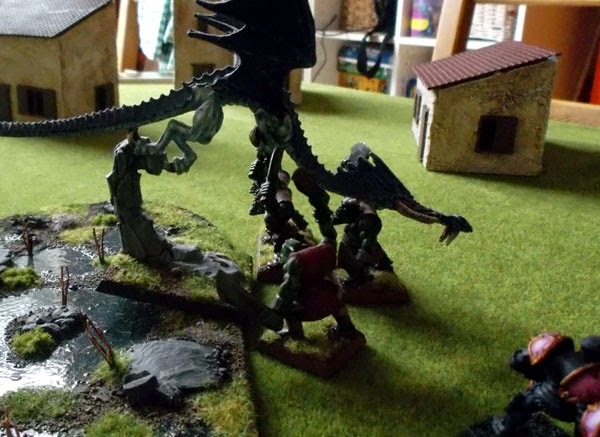 Gitsnag tried to coordinate an orderly retreat, but as he attempted to rally the lads the dragon caught him with a fiery blast and turned him to ash! 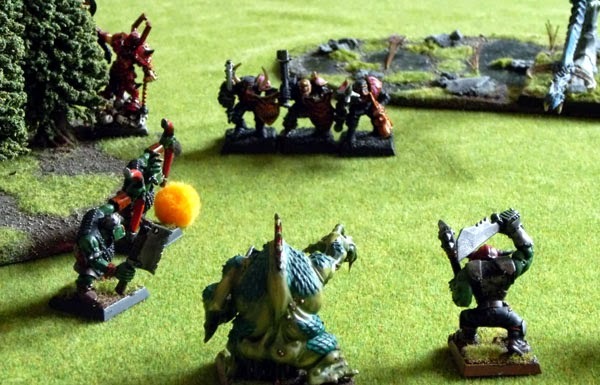 At which point the bulk of the Orcs turned tail and fed, leaving the field to the Chaos powers. Despite two consecutive defeats (he clearly takes after his old man) the youngest child was still eager for another game. 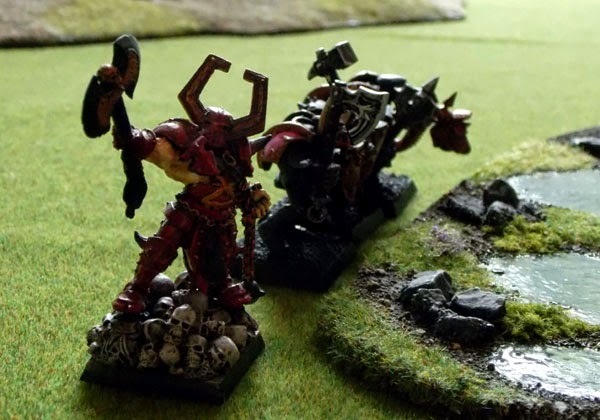 As we were now playing a campaign he was unable to replace his deceased leader and instead recruited two more Chaos Warriors to the cause. I prepared to roll for a scenario, but he announced that he'd thought of one - King of the Hill, where we'd place a hill in the centre of the board and whoever took control would be the winner. We agreed that two turns with no enemies on the top of the hill meant you could claim the title. 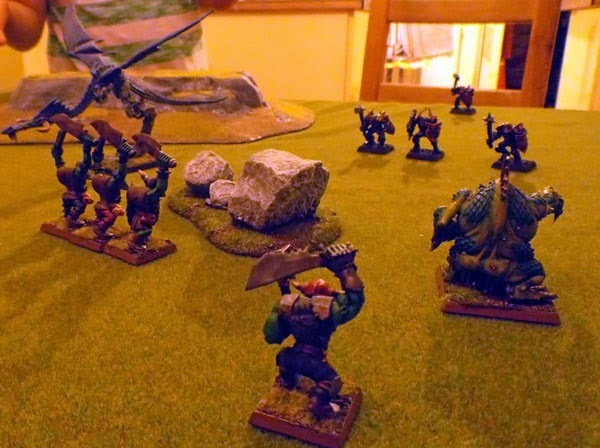 Our first turns saw a stumbling advance on both sides and I was first to get models onto the hill. 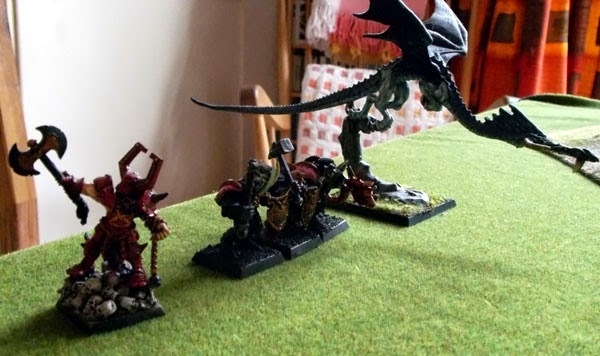 With the dragon leading the way I rather rashly charged the Troll forward to meet it (forgetting that it's Q5 would make it very difficult to order so far from my leader). The dragon duly unleashed fiery breath and knocked the Troll to the ground. 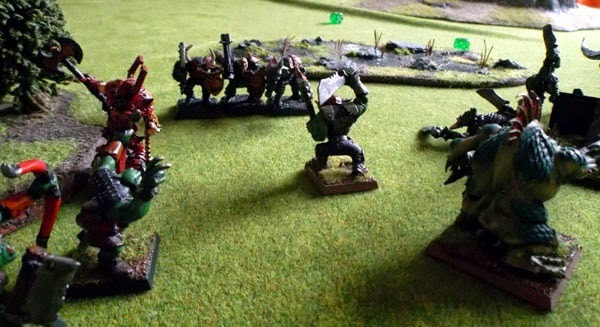 A second blast saw the Troll's toughness called into play to save him, and his quality dropped to 6(!). Having dealt with my main threat the dragon then flapped his way in a leisurely fashion to the top of the hill to deny me victory. 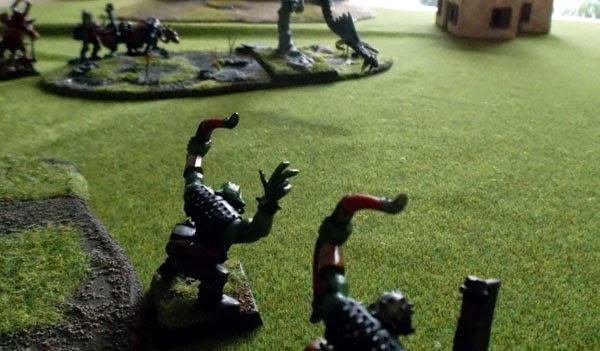 I began hurling Orc bodies at the big creature to little avail, Meanwhile the Orc archers took potshots at the slowly advancing Chaos warriors. With similar results. 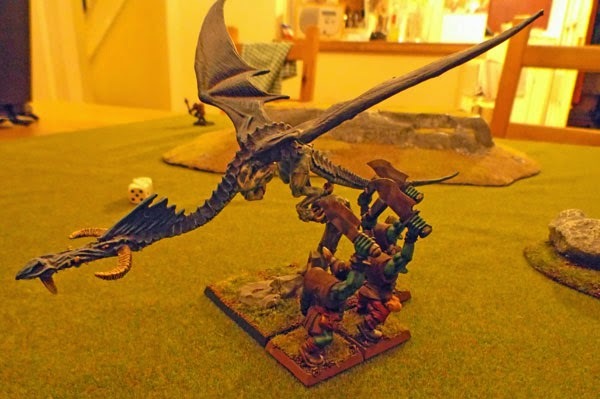 Eventually the dragon flapped to a sensible distance and began belching fire once more, singeing some of the boys. 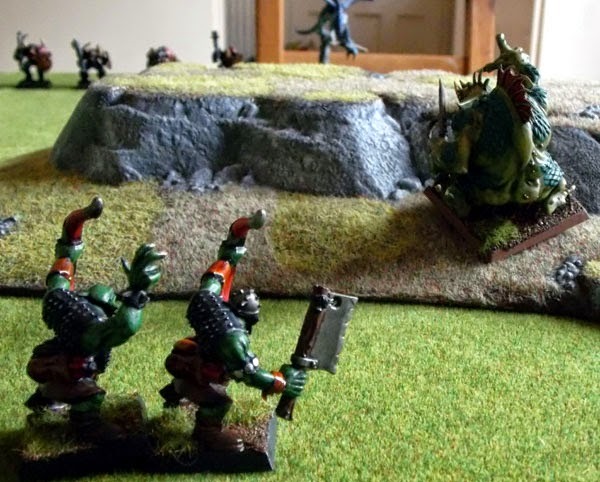 Finally the Chaos Warriors arrived at the hill and began chopping a swathe through the Orc defenders, dispatching both archers with ease. 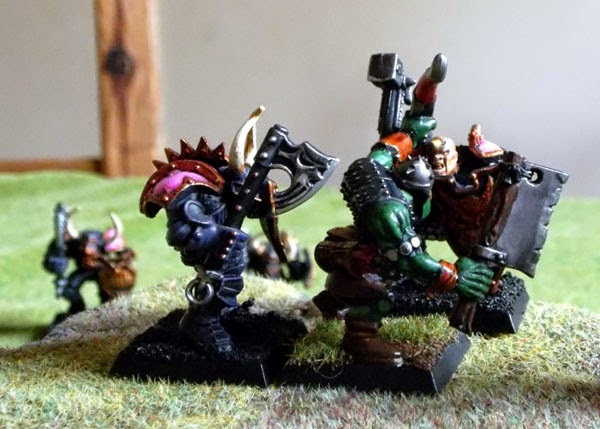 With the tide turning against him Gitsnag decided discretion was the better part of wotnots and legged it, followed by the remains of the warband. 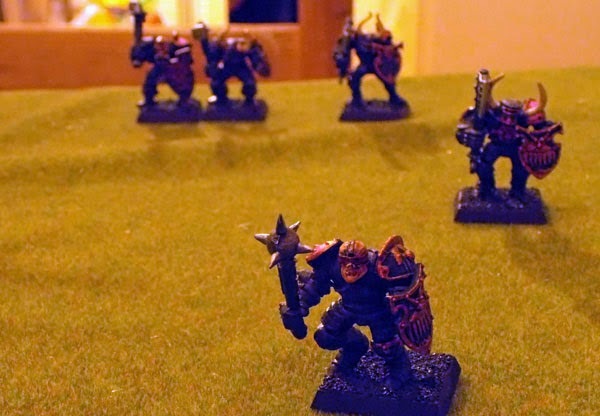 Victory to the small boy's Chaos Warriors! So, chastened after our recent game, the youngest offspring decided once more to take me on. 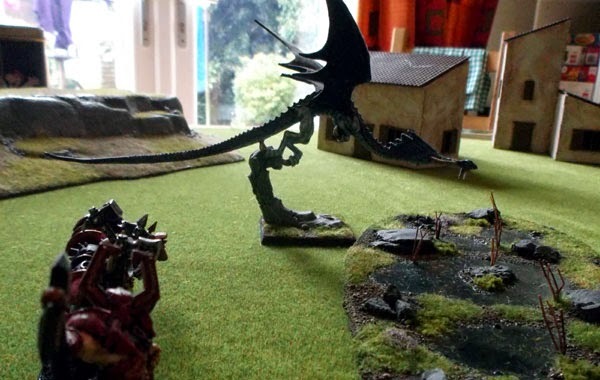 We both took 300 point warbands, he had a Chaos Warrior Leader, three Warriors and the aforementioned dragon. 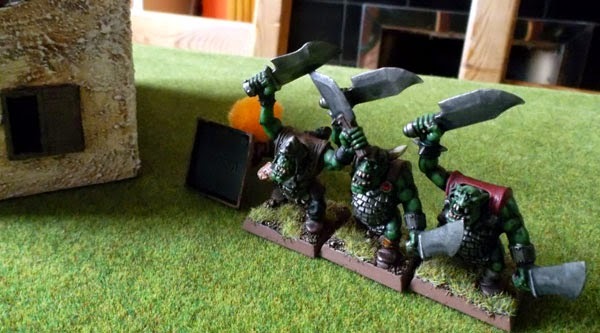 I had an Orc Leader, two Orc Archers, four Orc Warriors and a mighty Troll. 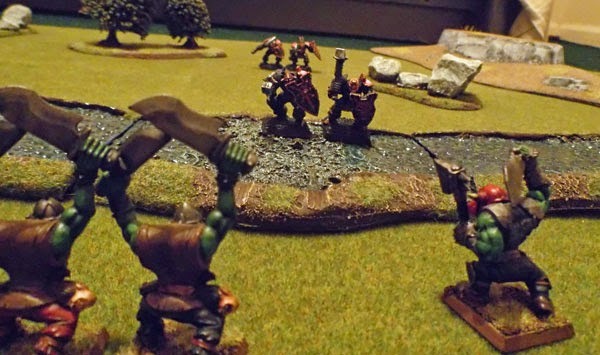 We decided this would be the start of a campaign and rolled for scenario. I was hoping for a change from the pitched battle, but a 1 came up, so we were up and at 'em again. 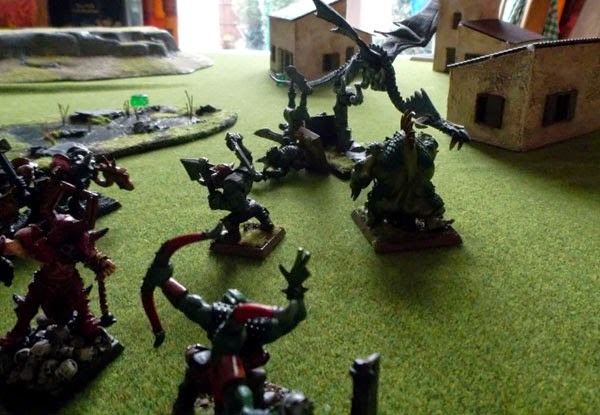 I experienced a fair few C and C problems as the battle began and the lads struggled to get moving. 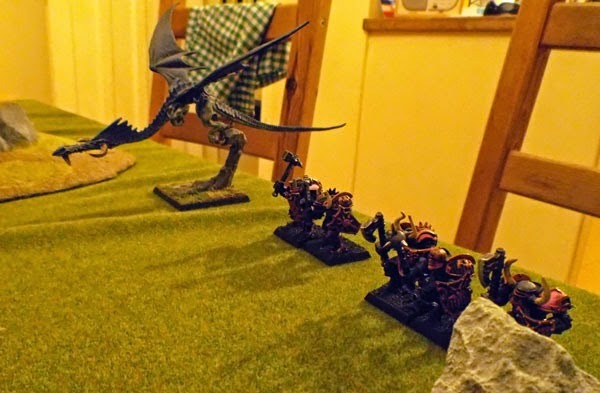 On the other side of the board, the chaos warriors advanced, sending the dragon forward on their left flank, from where it unleashed a flaming breath or two, singeing an Orc and knocking him to the ground. 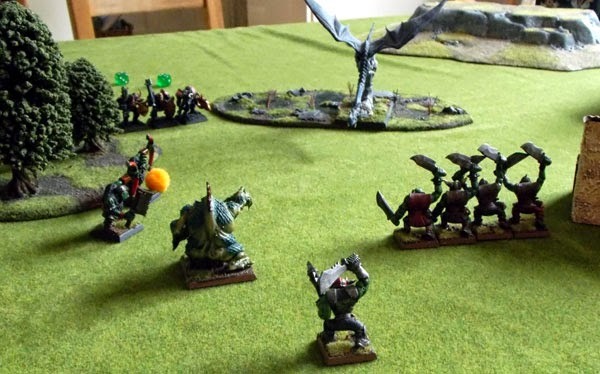 However it was enough to distract the winged monster who instead spat fiery orange death in the direction of the archer Orcs. Finally getting the boys under control I ordered them to charge the dragon, which didn't go as well as I'd hoped. 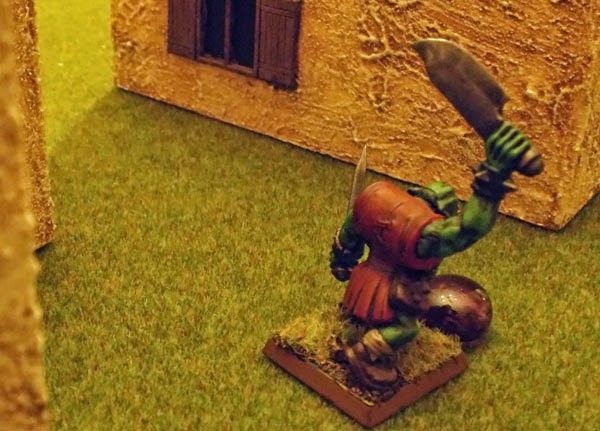 However a fortunate bow shot knocked a warrior to the ground. 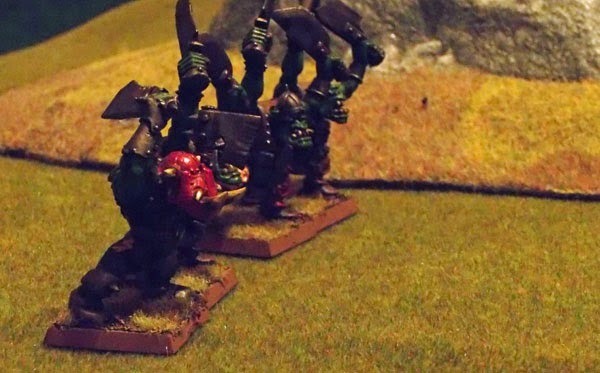 At this point the Chaos Warlord ordered a general charge along the line and fighting broke out in all directions. 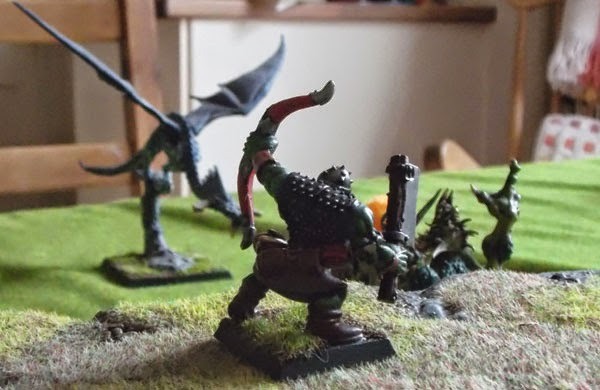 Sadly (and somewhat surprisingly) the Orc archers proved a match for the rampaging warlord, and despite a few Orcs falling to dragon claw, the rest of the warband fled with the death of their proud leader. 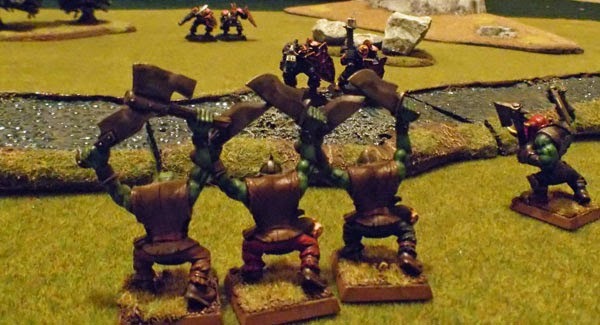 Victory once more to the Orcs! 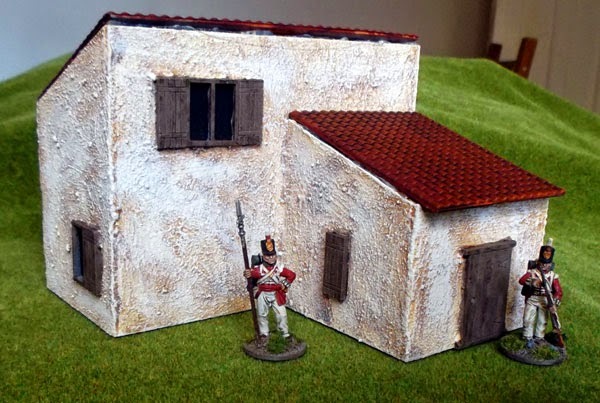 Finished off the Warbases Mediterranean buildings. 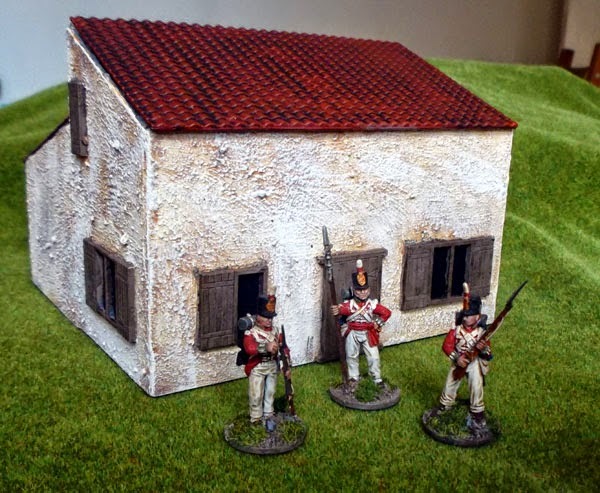 The roofs are Wills sheets - which are conveniently exactly the right size for the larger building widths. I painted them with GW Terracotta, gave them a wash with Devlan Mud, then drybrushed with the original mixed with a little orange. 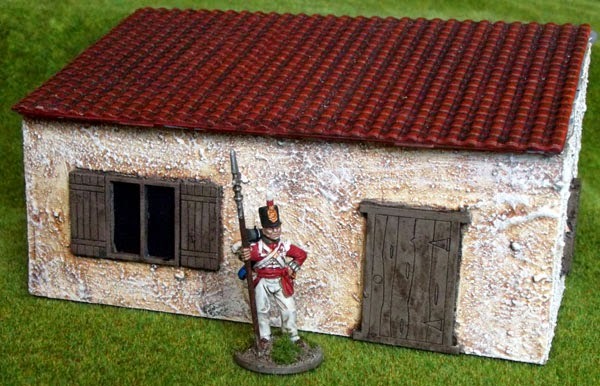 I suspect they may be a bit dark and dirty - our British roofs have been darkened by 20th century industrial pollution, and roofs in modern southern France for instance are much more orange. However, they look OK to my eye. 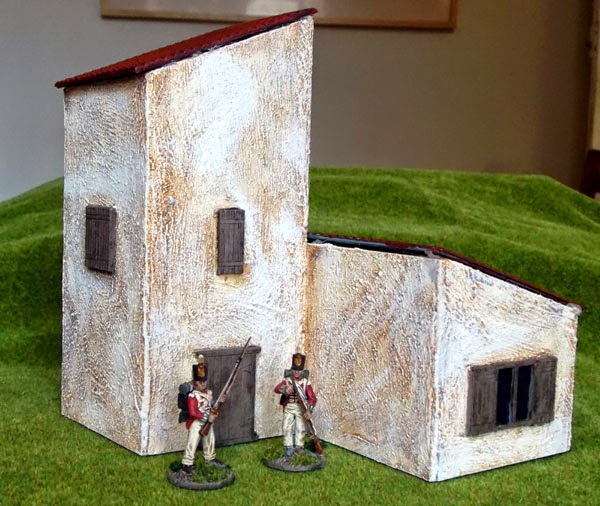 Pretty happy with how these turned out and they'll be ideal for Napoleonic games in the Peninsular War, or World War 2 action in Italy, Sicily or Crete. Gitsnag gathered the lads around. "Right, some of da little 'uns sez dey saw some dirty, clanky oomans clumpin aroud on da uvver side of Snotty Stream. Da boss sez we've gotta check it out. So let's go 'ave a look and wen dere's nowt there we can go back 'ome and duff up da little snots wotz made us come all da way out 'ere"
The lads grumbled and shifted lazily, then hefted their choppas and followed their leader. The servants of the dark powers appeared gripped with raw Chaos and their advance became fractured. 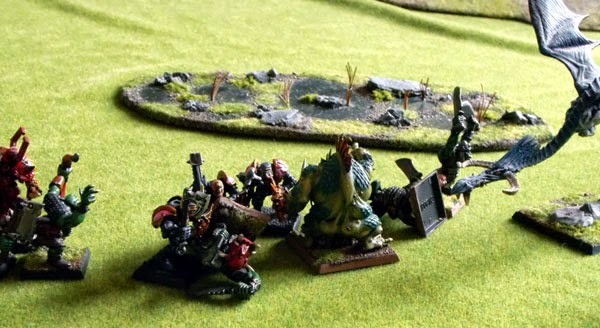 The evil warriors splashed first into the ford and Gitsnag shouted at the lads to not let them cross. 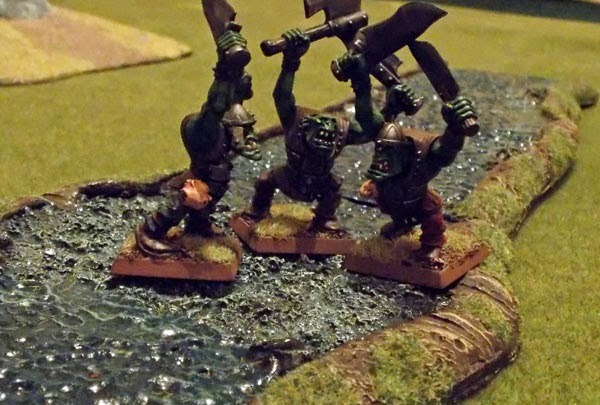 Fighting broke out in the waters of the ford as the onrushing Orcs overwhelmed the Chaos leader and held his head beneath the water until the twitching stopped. 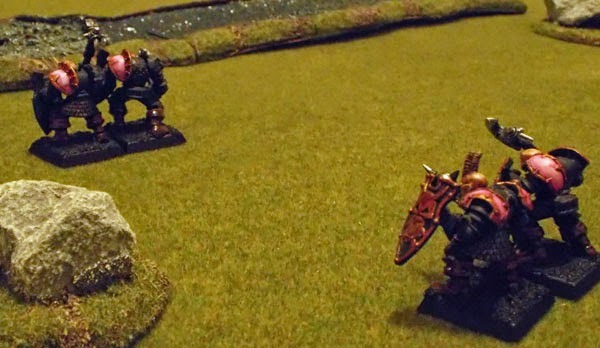 Dismayed the nearest Chaos warrior hurled himself into the waters and was carried from the field. "Dats da way ta doo it!" 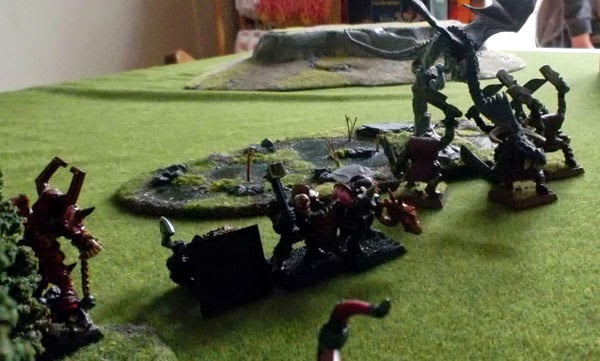 Finally the last foul servant of the Ruinous powers vanished beneath a hail of choppers and well aimed boots.